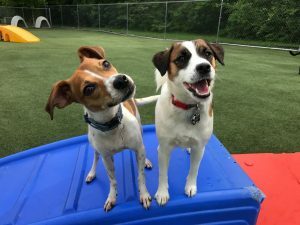 As we are continuously striving to give our furry guests the best experience we can, we require any dog interested in daycare and boarding to participate in a Temperament Evaluation. The evaluation is very much for the benefit of your dog to make sure that they feel safe and comfortable in this environment and are happy while they are here. Temperament Evaluations typically last 3 hours for a one-time fee of $25 for the 1st dog, and $10 each additional family dog, provided they all are evaluated at the same time. They can be scheduled, by appointment only, Monday through Thursday at either 8:30am or 12:30pm and on Fridays at 8:30am. The evaluations coincide with our two daycare sessions in order for your fur baby to be slowly introduced to the other dogs in our facility. This helps us learn more about your dog and how they interact with other dogs so that we can be confident in giving each dog the most fun and safest playtime! Plan to spend about a half hour when you bring your dog in for their evaluation. We will review your vet records and enrollment application, and the evaluator will meet you and your dog and answer any questions you may have. You do not stay for the Temperament Evaluation; we will call you when it’s over and let you know how your dog did. If they enjoyed themselves, they are welcome to stay for the duration of the day. Once your dog has passed the Temperament Evaluation, you will be able schedule daycare and boarding sessions by logging into your account on our scheduling software program, PetExec. If your dog will be staying overnight and has not attended Daycare before, you must schedule your pet’s Temperament Evaluation prior to the check-in date of their overnight stay. We recommend having your dog attend a few sessions of daycare before leaving them for an extended time. Your dog will be more comfortable and will enjoy a happy, healthy stay by having attended daycare prior to you leaving them here for their overnight or extended stay. Happy Dogs delivers an invaluable service that is hard to beat. The owners and staff demonstrate great love and attention when taking care of my “fur” baby. Their dedication to providing a clean, safe and fun environment provides me with great peace of mind and a tired, happy pooch at the end of the day! We love Happy Dogs!! Max always seems so excited when we arrive! We really appreciate the TLC that Max gets when he is there!!! Thank you again for all you and your staff do! Tucker loves it here. Been coming for over 8 years. A trusted place for my buddy. We’ve used numerous doggie day care facilities and kennels throughout the years and this one is heads and tails above the others! Their outdoor play area, the fact they bathe the dogs before I pick them up after staying 7 nights or more (FREE OF CHARGE) are all just the extras on top of amazing owners and an awesome staff. They treat my pups like I do – like they’re my fur kids! I first starting using Happy Dogs in 2011 with Chelsea, my lab mix. They took great care of Chelsea. She always liked going there. When she became ill in May 2014, they took great care and got her to the vet. Chelsea died and Happy Dogs was great about helping with disposition and reaching out to me in Chelsea’s passing. Now Tilly, who I adopted in Dec 2014, goes happily to Happy Dogs. We actually drive from Van Buren, IN, to use Happy Dogs. Thanks for all you do for our beloved fur-babies. Call or Text us at (765) 288-8186 Contact Us! Our 7,000+ sq ft facility includes indoor dog daycare, boarding, grooming, self wash tubs, training and a retail store. Our multiple outdoor parks, covered with canine-turf, are equipped with obstacles, toys, and bubbling fountains for hours of supervised play for well-socialized dogs. We also have a grassy outdoor play area that includes a sand pit for digging. Our friendly staff, certified in Pet CPR and First Aid, interact with the dogs using behavioral training techniques to keep the environment safe and calm. © 2019 Happy Dogs. All Rights Reserved.